Thinking of buying a home in Austin soon? For today's home buyers, the value of "good credit" has never been higher. Virtually all Mortgage loan approvals will depend on your FICO score, as does your final mortgage rate, which varies depending on what range your FICO score falls into. 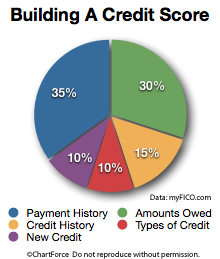 If you're shopping for a home or contemplating a refinance, be aware of how credit behaviors can affect your FICO score. Even small events can make a big impact. For example, we often work with clients who's score is only off by a couple points from getting a the "best rates." Do you think the lender is going to make an exception? Probably not... So, it pays to know where you stand with your FICO score several months in advance.